What do NASA and the mechanical insulation industry have in common? They both use the latest materials technology to produce the highest quality results possible in a variety of severe conditions. Often NASA develops an innovation for the space program that makes its way into industry and daily life, and aerogels are a perfect example. According to NASA, aerogels were first invented in the 1930s, but “groundbreaking methods of creating new types of aerogels have changed the way we think about insulation.” Aerogels are created by combining a polymer and a solvent to form a gel, and then removing the liquid from the gel to be replaced with air. They are some of the lightest solid substances in the world, are extremely porous, and have a very low density. Oh, and they’re also considered to be one of the most effective insulation materials on earth. The best applications for aerogel insulation? Extreme high and low temperatures, places where space is extremely limited, and any water applications, including steam piping. What’s So Great About Aerogel Insulation? To really see the effectiveness of aerogel insulation, check out this video of our blowtorch test! Post by North Country Mechanical Insulators. Aside from the fact that it’s used in space shuttles (how cool is that!? ), aerogels have an extremely high R-Value to thickness ratio, meaning that the ROI is often less than 12 months. It’s hydrophobic—you could dunk aerogel in water for 2 days straight and it will be dry when it comes out. At only .8” thick, it’s still the most efficient insulation material available. One .8” thick piece of aerogel is equal to 2 ½ inches of fiberglass or 3 inches of calcium silicate. What are the Types of Aerogel Insulation? At NCMI, our supplier Aspen Aerogel provides two different types of aerogel insulation—Cryogel and Pyrogel. Cryogel from Aspen has the lowest k-value of any cryogenic insulation material in the industrial market. With up to 5x better thermal performance than other insulation products, zero permeability, and reduced time, work and labor to install, it can’t be beat for efficiency. Pyrogel is the most effective high-temp insulation available: efficient, durable, environmentally safe, and more productive to install than competing insulation materials. How Much Does Aerogel Insulation Cost? This is a premium insulation product—probably the most effective material we use at NCMI. 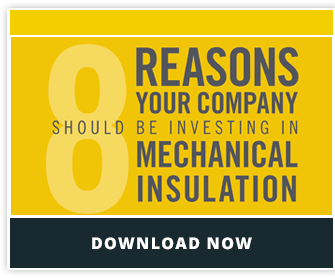 While the initial cost may be more than other types of mechanical insulation, the reduced labor time coupled with the average return on investment time makes this well worth the cost. Read our Case Study about how we used aerogel insulation to reduce energy costs form Rock Tenn Paper.